Today I made an effort to capture my hard work and it may be due to the many steps of preparation this recipe required. However, your food processor and blender do most of the job and the hardest part was washing the dishes! There are plenty of recipes online for Raw Cashew Cheesecakes, and they are for the most part very similar, but I decided on this one as it seemed like the easiest, and I also had all the ingredients, except the pecans for the crust, so I substituted walnuts. 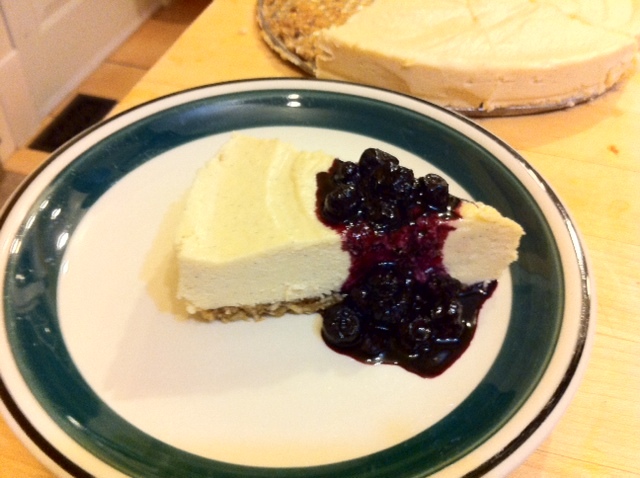 I also made a simple blueberry sauce (not raw) to go with it…and voila yummy rich and creamy Cashew Cheesecake! As mentioned above, you’ll find the recipe at: http://wholefamilyfare.blogspot.com/2011/01/raw-cashew-cheesecake.html where you’ll find even better pictures than mine that are very drool worthy, which was one of the other reasons why I made this recipe! But here is a recap of what I did, the filling is exactly the same and I’ve just made more of the crust, cuz it’s really yummy! For the crust, put all the ingredients in your food processor, give it a whirl until its mixed up into a sticky texture. Flatten the sticky datey walnuty coconuty textured thingy onto the bottom of a springform pan evenly. I was going to put a cut-out Parchment paper for underneath it, and I didn’t..but I should have! You blend all the filling ingredients in your blender until nice and creamy..really creamy. If you have a vitamix, I am jealous! Pour this mixture in to the set up springform pan on top of your crust. Bang it a few times on your kitchen counter to even out the top and let it set in your freezer for at least 1-2 hours. If the cheesecake has been in the freezer for longer than that, then cut the slices frozen and let them defrost on the kitchen counter for 20 min. before serving. In a medium sauce pan heat up the blueberries to a gentle boil for about 5-10 minutes, until they have reduced to half of it’s size. You can tell this easily by looking at where the blueberries have made a line on the side of your sauce pan. If the sauce is half of where that line is, you are ready to take it off the heat. Add the agave nectar at any time; taste the sauce and add more to your liking. My cheesecake tasted a bit too lemony because I actually didn’t have the 3 1/2 cups of cashews, but that was ok as I love lemon cheesecakes and it went quite well with the blueberry sauce! Yummm…I hope you enjoy it too…and I hope I remember to take pictures for my blog more often!